It is an inflammation of the gum around a dental implant. The gum next to the dental implant looks red and angry, swollen up and puffy. The gum will probably bleed a bit when you brush, and it will be tender and uncomfortable. BUT it is not just the visible, pink gum that is affected. What you actually see is possibly just the tip of the iceberg! Peri-implantitis also affects the bone under the gum, around the neck of the implant. This is important, because inflammation in the bone around the neck of the implant will lead to break-down of the bone. The bone right next to the dental implant surface starts to erode, and shrink back away from the implant. This is then followed by shrinking of the gum around the implant. Sometimes if the gum shrinks enough, you will be able to see the metal implant surface showing! Obviously, if the bone around the dental implant shrinks, then the implant is losing support. It may well become over-loaded, and start to become loose. Once the implant starts to move the TINIEST BIT, there's no going back. It will get looser and looser, and will eventually "fail". It will either fall out by itself, or become so loose or uncomfortable that you will go along to your dentist, and he will have to take it out. SO, it is VERY important to keep an eye on the gum appearance around your dental implants, and watch out for any signs of redness and inflammation that could be the start of peri-implantitis. YOU WANT TO CATCH THIS PROBLEM AS EARLY AS POSSIBLE! What are the symptoms of peri-implantitis? At first, the gum around the implant will be a little red. Gums should be pale pink! If you look very carefully, you may see a red edge to the gum, just where it touches the implant cap or crown. Next, the gum may bleed a little when you brush or floss around it. Your gums should not bleed when you brush them! If your hands bled when you washed them, you'd be worried, right? Then, the gum next to the implant will become a little puffy. If you look very carefully, the surface of the gum will be smooth and shiny. Normal gum should be matt, with a surface like orange peel. At this point, the gum around the implant will become tender, feeling a bit sore when you use a toothbrush. Finally, the gum around the implant may start to shrink back, gradually exposing the top of the implant as a grey or black metal edge. If left untreated, the implant will become loose and eventually either fall out or have to be taken out. Peri-implantitis - What are the causes? The cause of peri-implantitis is always bacteria under the gum, next to the implant. Something doesn't fit properly, such as a loose healing cap or a loose implant crown. Bacteria will always find a way into any microscopic gaps. 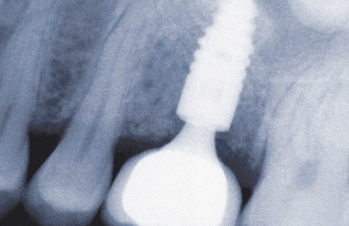 This includes the tiny gap where the crown is fitted to the implant. Something is microscopically rough, such as the edge of the crown, or there may be some small bits of dental cement trapped under the gum. Plaque is being left behind when brushing and flossing. If you leave plaque behind when you brush and floss around the implant, the bacteria get a chance to breed! 1. Get rid of any little places where the bugs can hide. This means checking to see if a healing cap is loose, or a crown is loose. If they are, they should be removed, sterilized, and re-fitted tightly. 2. Check to see how you can clean better around the implant, including under the gum. This means using dental tape, floss threaders, and maybe a single - tufted brush such as a Sulcabrush. Using a HIGH QUALITY toothbrush is always a good start, and I STRONGLY recommend a sonic brush around implants. The BEST toothbrush is the Cybersonic 3 by Amden. An extra cleaning method when you have peri-implantitis is to use a WaterPik oral irrigator with a capful of TheraBreath Perio Rinse added to the water in the water tank. If you use the fine "Pocket Pal" tips, you can clean effectively under the gum edges where the plaque can escape from toothbrushing. The Perio Rinse will release oxygen under the gum, killing the plaque bacteria. I recommend the Perio Therapy System Kit from TheraBreath, which comes with a gel for treating peri-implantitis. If you have noticed some of the symptoms of peri-implantitis, go to your dentist to get it checked. He will look to see if there are any loose implant components. If there are, he should remove them, sterilize them, and re-fit them tightly. Some specialists recommend packing the inside of the implant with an anti-bacterial gel such as Corsodyl gel. If your dentist can't find anything loose, he should carefully clean around the implant, under the gum, to see if there are any edges or "catches" on the crown that would harbor bacteria. He should remove any tags of cement that he finds. Finally he should make you an appointment with the hygienist, so that she can check how you are cleaning around the implant, and give you some tips on any bits you may be missing with brush or floss. Peri-implantitis can result in the implant failing and having to be removed. So look for the symptoms and catch it as early as you can! Remember, I highly recommend the Cybersonic 3 sonic toothbrush. It has the BEST performance of any brush I've tested, and you can get it at HALF price if you use the discount code on my Best Sonic Toothbrush page.